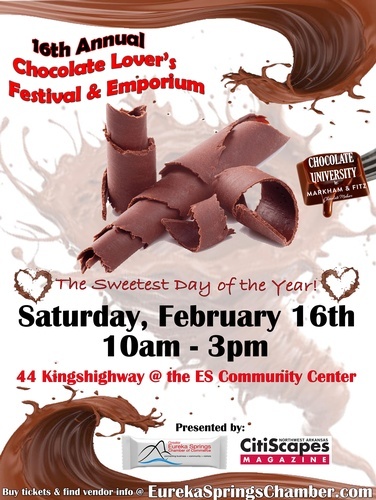 Continue your Valentine's Day celebrations with a complete world of chocolate appreciation at the 16th Annual Chocolate Lovers' Festival! Join us at the Eureka Springs Community Center (44 Kingshighway, Eureka Springs, AR). This treasured annual event includes vendors who showcase and promote their unique products while offering chocolate samples to guests. This years' event will showcase some of Eureka Springs premiere romance and wedding businesses. Be sure to visit the Markham & Fitz Chocolate University for an additional $2.50! CLICK HERE for more information on Markham & Fitz. Ticket prices are $12.50. Tickets may be purchased at the door on event day. Visit the on-site Markham & Fitz Chocolate University for an additional $2.50.